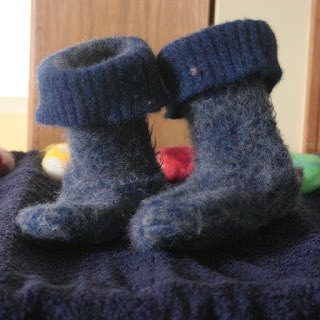 My friend, Carol, told me to look at the slippers a woman on Ravelry was making from recycled sweaters. I loved them and found out that she sells the patterns (google Kriskrafter) and bought them right away. I've had many people tell me they wish I made slippers for adults, but I didn't want to fiddle with trying to come up with a pattern. So those clogs above are my first attempt. Kriskrafter suggests using unfelted sweaters, but I didn't have any, so I used a sweater that hadn't felted really tight, and I'm really happy with how they turned out. They are an adult large (they almost fit my size 11 feet). They're still wet, and not done yet - I haven't added the ribbing around the edge that will help them look finished. 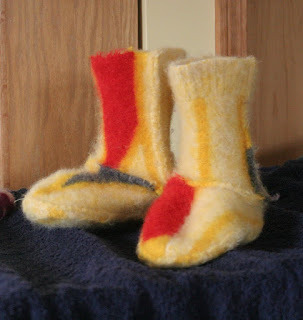 Here's the first pair I made from an unfelted sweater. It was not a tight knit, and I don't like how they came out. 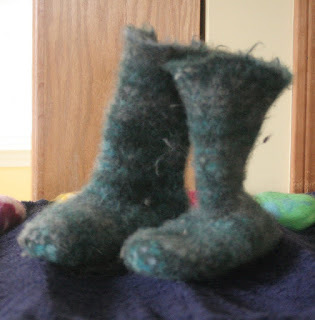 They are very light and raveled a LOT even though I sewed around the edge, and they're not stiff the way I'd like, even though they are quite felted. This was my third try. This was an unfelted sweater, but I know this kind of sweater felts up well. The left slipper doesn't really look that anemic, it just didn't want to stand up straight. All of them are still drying and haven't been trimmed yet; that's why they look so furry. The pattern says you should sew most of the seams on the outside so that they are not on the inside to bug the feet. I didn't read carefully enough, though, and sewed everything with right sides together, and I like the way it looks. Here's a pair I sewed the "right" way, with the seams on the outside, and I don't like it much. Also, even though all of these boots were HUGE before felting, they are not adult size now, which is disappointing. My remedy will be to use prefelted sweaters, sew them, and put them though a cycle or two in the wash to finish the felting process. If it works out the way it did with the tan clogs, I should get adult slippers. These were a pleasant surprise. I wasn't positive this was a wool sweater - the tag was written in Japanese or Chinese or something, and when I was working with it I was very dubious about what it would look like. It was wool and felted up best of the boots I've made so far. This one I did with the seams on the outside and for these it worked well. 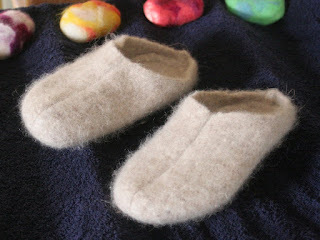 The fun of felting for me is that it's always an adventure. I never know how much something is going to felt, or exactly what colors they will be, since the felting intensifies some colors and heathers others. 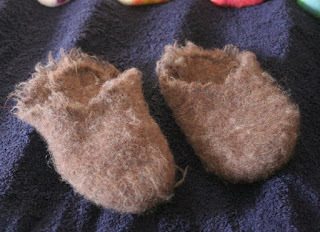 I'm off to try some more clogs with prefelted sweaters!